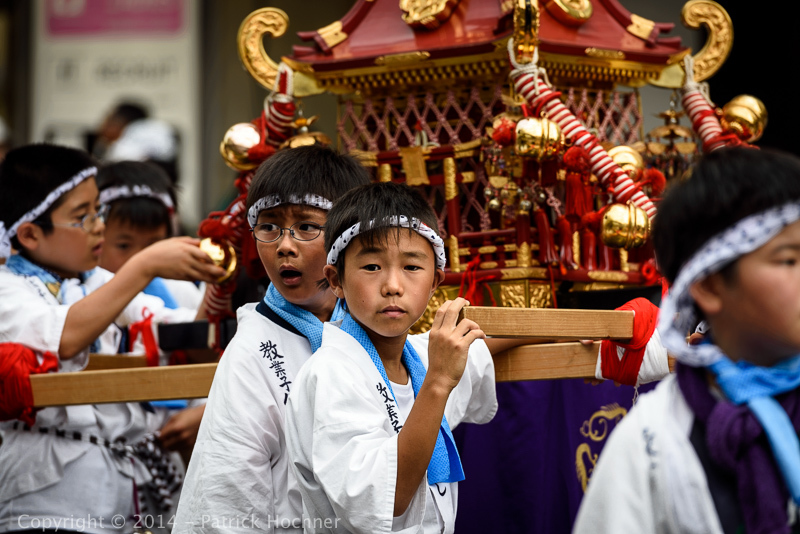 The Hanagasa Junko (花笠行列) or Hanagasa Parade is, after the main Yamaboko Float Parade held on July 17th, the second largest public event of the Kyoto Gion Matsuri. It took place on the morning of July 24th, in parallel to the second and smaller Yamaboko parade. The word hanagasa consists of two kanji, two parts: “hana” (花) means “flower” and “kasa” (笠) means “umbrella”. During this parade, we can see a number of large umbrellas and numerous hats decorated with flowers. It is, as is often the case with Japanese festival, a beautiful show for photographers (and everyone else), with gorgeous historic costumes and make ups. 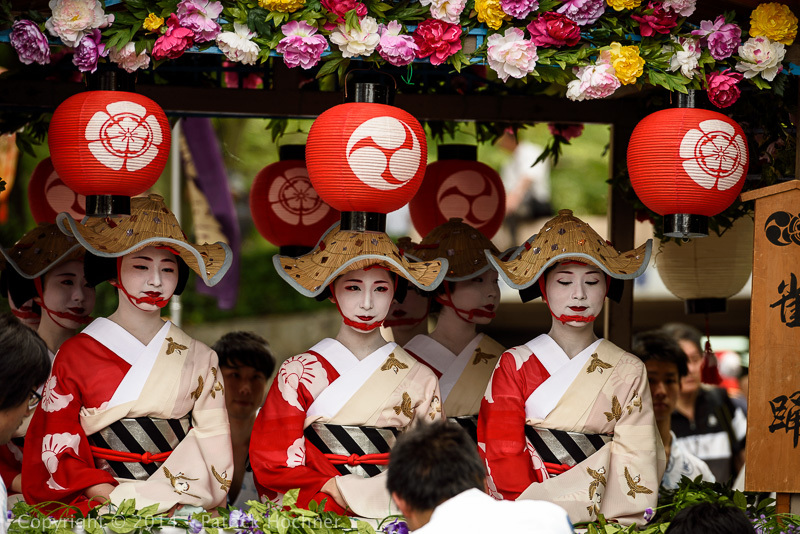 This Hanagasa parade is a great opportunity to see Maikos, the geisha apprentices, taking part of the parade grouped together in carts pulled by young men. 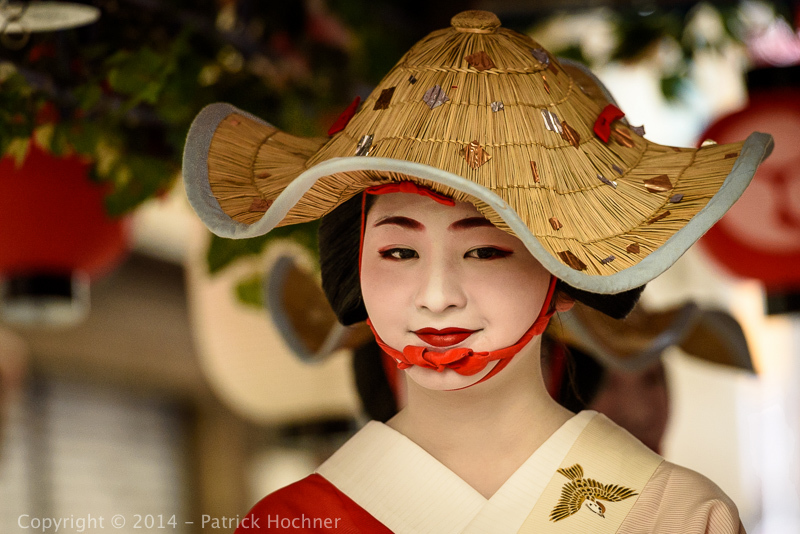 The Maikos came from two separate hanamachi (geisha districts), Gion Kobu and Miyagawa Cho. 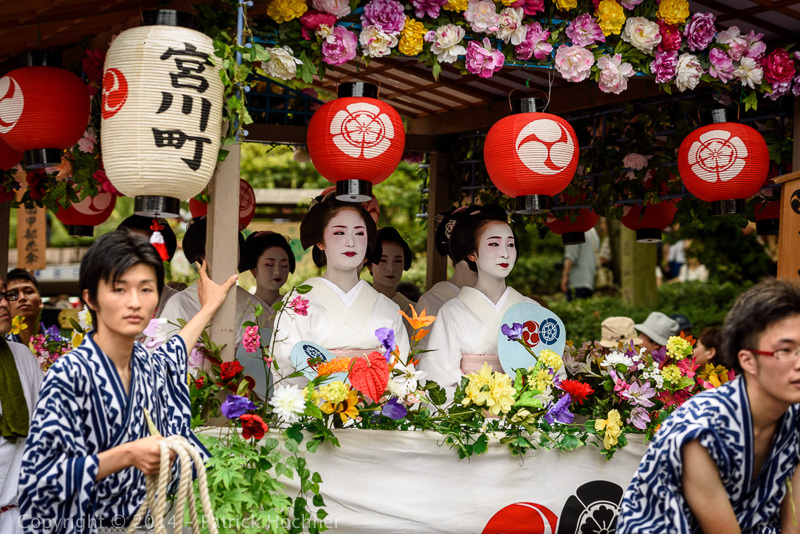 The first ones were wearing beautiful red and white kimono and a straw hat, while the later ones had a more simple elegant white kimono with no hat. In addition, there were various other groups of people, musicians, children, old ladies, young ladies, costumed kids on horses, samurai warriors, beautiful little girls, etc. , all in kimono or historical costumes with colorful accessories and make-up. A real treat to the eyes!